This morning, we learned how to upload a variety of planning lines for the survey that will be conducted for the Atlantic Seabed Mapping International Working Group (ASMIWG) established area Southeast of Bermuda. The black circle pictured on the map below is Bermuda’s Exclusive Economic Zone (EEZ). Bermuda’s EEZ is an area of ocean within 200 nautical miles of the island that covers 464,940 km2 of ocean. Under the United Nations Convention on the Law of the Sea, Bermuda has special jurisdiction over the use and exploration, management, and conservation of those resources. According to Bermuda’s Department of Environment and Natural Resources, this zone was established in 1996 and this distinction allows Bermuda to gain important economic value from these resources. The black circle pictured above is Bermuda’s Exclusive Economic Zone. The red line is the outline of the survey area and the green lines are previously collected data that will be considered when the Okeanos Explorer collects new mapping data. The red line (ASMIWG Galway mapping box) displayed on the screen is the outline of the survey area. This area is 145,120 km2; however, during this expedition, we will be mapping a quarter to a third of the region. Within the survey area are small blue lines that are considered to be planning lines. These lines were crafted on the computer using Hypack and are 180 nautical miles in length. For efficiency, it is important for them to be oriented to follow the contour lines, and to be long because it requires less turns, which saves time while mapping. The distance between the lines is 4,300 meters and may be subject to change at the discretion of the mapping team. The green lines are existing multibeam or bathymetric data in the region. This is crucial information to consider because the Okeanos Explorer’s goal is to map what has not been investigated and combine it with the data that already exists in those areas. The previously collected data was recorded from a variety of ships such as Atlantis, Healy, and Knorr, so we will use our EM 302 sonar to edge match their data. In addition to the existing data, there is a background telemetry layer (blue background) that shows satellite measurements to predict what the seafloor may look like. Scientists use the existing data to update the layers to create a more accurate depiction of the seafloor. So far, the data collected in transit has been very reliable due to weather conditions and the flat abyssal seafloor. As survey data is incoming, the personnel on watch must ensure that the sonar and computer systems are operating correctly. We will begin the actual surveying this afternoon once we reach the first line! Now that we have begun the survey, everyone is busy collecting, processing, cleaning, and updating data files in the Mission Control room. We have been learning all about the software used to create files, and it is very interesting to learn how all of the different systems are being used to make sense of the data from multiple sources (ex. EM 302, EK 60, and sub-bottom profiler). Everyone on board is really enjoying each other’s company and is eager to collaborate to help one another learn. It is really fun! One of the best parts of being in the middle of the ocean has definitely been watching the sunsets. They are incredible! 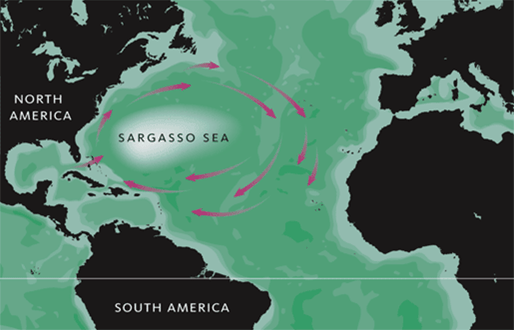 The Sargasso Sea is considered to be one of the great ecological wonders of the world! It is home to golden algae known as Sargassum. This algae serves as a floating habitat and provides food, refuge, and breeding grounds for an array of marine organisms such as fish, sea turtles, marine birds, crabs, shrimp, and more! The Sargasso Sea is the only sea in the world surrounded by currents, rather than land and Bermuda is the only island within it. The algae directly benefits Bermuda when it washes ashore and sinks into the sand since it fertilizes the soil and protects the island against storms and erosion. Unbeknownst to Cheryl, Chief Scientist Rhian Waller, even though she was very busy preparing for the cruise, brought balloons, streamers, candles, and noisemakers to celebrate Cheryl’s birthday today. This morning, Chief Scientist Rhian Waller announced that we are steaming toward the end of the west arm of Glacier Bay to Johns Hopkins Glacier. This is a place where cruise ships take tourists in the Fall. But the Park Service has it closed during the Spring and Summertime because it’s a harbor seal nursery. The nightshift workers are trying to catch a few winks of sleep before we get there. No one wants to miss it. We are hoping for clear skies. Johns Hopkins Glacier is one of the few glaciers that is advancing instead of receding. As it advances, it is joining the Gilliman Glacier. It’s 10:30 am and we’ve arrived sooner than I expected. Johns Hopkins Glacier is really something to see! So massive. Once again everyone is out on deck taking pictures and oohing and aahing. The glacier has shades of blue and white with streaks of brown and gray. It has a covering of white snow that looks like cake icing. The glassy water is a blue-green color with a multitude of icebergs floating in it. Bob Stone uses a term we all like—“bergy bits”—meaning small pieces of floating ice. He even brought some “bergy bits” onto the ship for us to add to our water or soft drinks. So refreshing! While on deck taking pictures we hoped to see the glacier calve and fall into the sea. It sounds like thunder. We waited and we waited and finally a couple of small ones happened. Also, a couple of snow avalanches slid off the mountains into the water leaving dirty brown streaks along the slopes. Our scuba divers went down for another exploratory look and came up with a first! They found Primnoa pacifica in the West Arm! This is the first Primnoa pacifica ever found here. They described it as spindly and small in comparison to the others found in the East Arm. The scuba divers continue their search for Red Tree Coral. The significance of this Red Tree Coral being in the shallow water is that it has been considered a deep-water coral. There are two broad categories of coral: warm-water coral and cold-water coral. Generally, warm-water coral live in shallow, tropical waters. Cold-water coral live in deep water. The emergence of cold-water corals like Primnoa pacifica in the shallow waters of Glacier Bay has caused scientists to re-evaluate their understanding and descriptions of these organisms. The third and last scuba dive for today was described as “mud, mud, and more mud”. A bit of a disappointment but they did bring up an interesting little critter. This sea squirt is a tan color here in the wet lab, but according to Bob, in its natural habitat it has a bright cherry red color. Well, it’s finally suppertime! 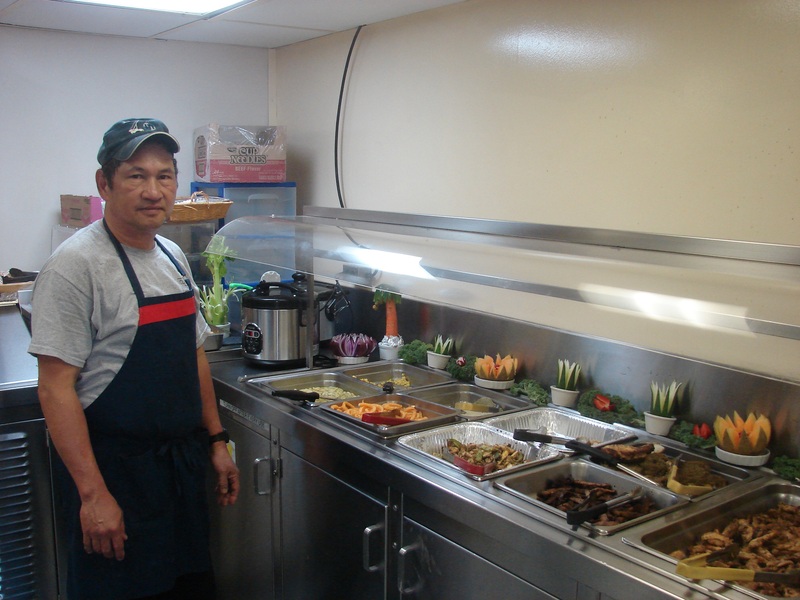 That means “Birthday Party Time!” The ship’s chef, Harry served up a delicious meal of salmon, barbeque chicken, steamed kale, baked summer squash, scalloped potatoes and a big salad. For dessert, he prepared a layered chocolate cake with freshly made whipped cream and strawberries. Everyone sang “Happy Birthday” to Cheryl. After she blew out the candles we went out on the deck and ate cake with new friends in the view of majestic mountains and glaciers. A birthday to remember, I’ll say. Now it’s back to work and the ROV crew is getting ready to deploy Kraken 2 for another night of exploration! Today has been a day of anticipation and inspiring wonder. I’ve tried to stay out on deck watching the glacier. Hoping for calving and avalanches. It’s really neat to me that no one else is here. We haven’t seen anyone else except four Park Service employees who boated out to meet us today. I found out that there are over 1,000 glaciers in Glacier Bay National Park! Some of them aren’t even named. I enjoyed watching a couple of bald eagles sitting on icebergs. And the absolute coolest thing has been the discovery of Primnoa pacifica in the West Arm of Glacier! I could feel the excitement in the air! It’s so thrilling to be a part of this scientific exploration and to learn from these world-class researchers! Mapping of our first priority area is now compete and we have moved to the priority two area on the north side of the Puerto Rico Trench. We are more than 100 miles from shore at this point. 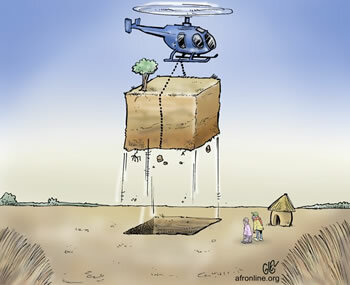 Land is nowhere in sight. Able-Bodied Seaman Ryan Loftus tells me that even from the bridge the horizon is only 6.4 nautical miles away due to the curvature of the earth. At this point with no frame of reference other than celestial bodies, navigation equipment becomes essential. On the radar display, we are in the center of the circle. Our heading is the blue line. Since this photo was taken near shore, the yellow patches on the bottom indicate the land mass, Puerto Rico. The two triangles with what look like vector lines to the left of us are approaching vessels. On the right, the Automated Identification System displays information about those vessels, including their name, type, heading and speed. 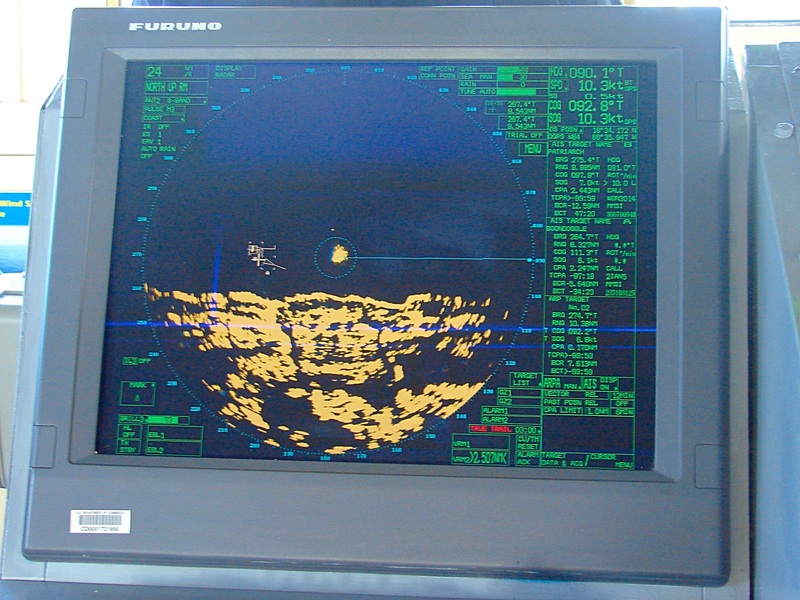 The radar uses two radio beams, an S-Band at 3050 MHz and an X-band at 9410 MHz, to determine the location of the vessel relative to other vessels and landmarks within a 1% margin of error. A standard compass points to the magnetic north pole rather than true north, therefore mariners prefer to use gyrocompasses for navigation. Before departing, a gyrocompass is pointed to true north. Using an electric current, the gyroscope in the device is spun very fast so that it will continually maintain that direction during the voyage. Slight errors build up over time and must be corrected. The watch standers post the necessary correction on the bridge. 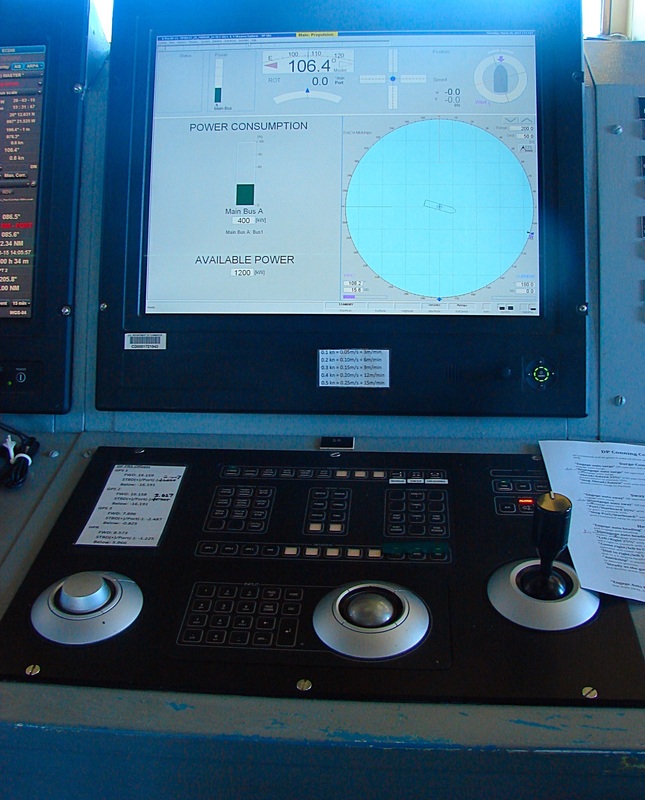 Since the device is electronic, it can feed data into the system allowing for automated navigation and dynamic positioning systems to work well. 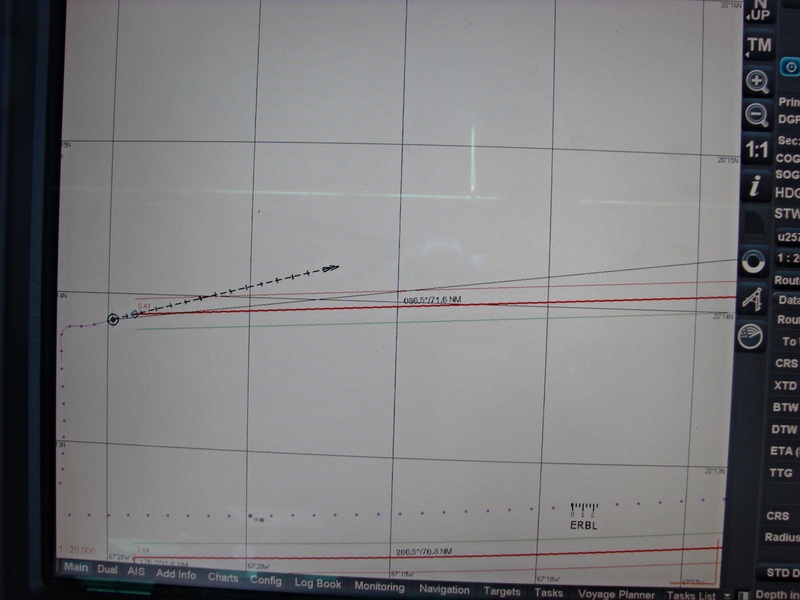 On the Electronic Chart Display Information System (ECDIS) screen, watchstanders can view the course planned by the Expedition Coordinator in charge of the science conducted on the voyage (in red), see the bearing they have set (thin black line), and see the actual course we are on (the black, dashed, arrowhead line). The dynamic positioning system allows the vessel to remain in one spot in very delicate situations, such as when they lower a tethered device like the robotic vehicle they will be using on the next cruise or a CTD (Conductivity, Temperature and Depth probe). It is also helpful for docking. The electronics are able to control the ship due to the ingenious way the engine system is designed. The diesel engine powers generators that convert the mechanical energy into electrical energy. This way electrical energy can be used to control main hydraulic propellers at the stern as well as electric bow and side thrusting propellers. What happens if the power goes out and the electronic navigation devices fail? There are back ups – no worries, students and family!! The vessel can sail onward. It is equipped with a magnetic compass and the watchstanders are well versed in reading charts, using a sextant, and plotting courses by hand – they often do that just to check the radar and GPS for accuracy. 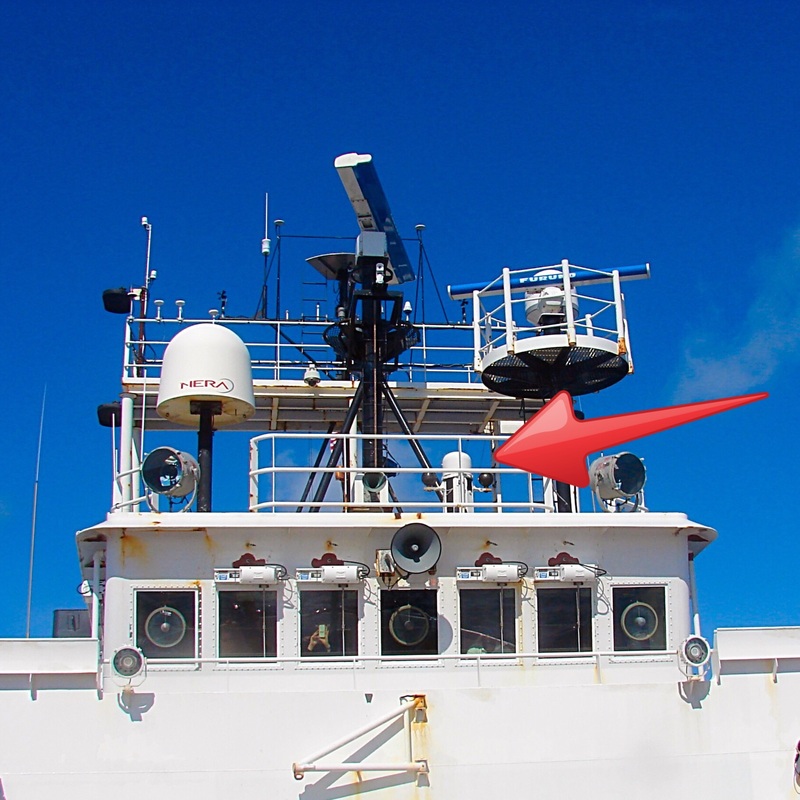 The superimposed red arrow is directing your attention to the magnetic compass above the bridge. Operations Officer, Lt. Emily Rose cross checking the radar and GPS with nautical charts. 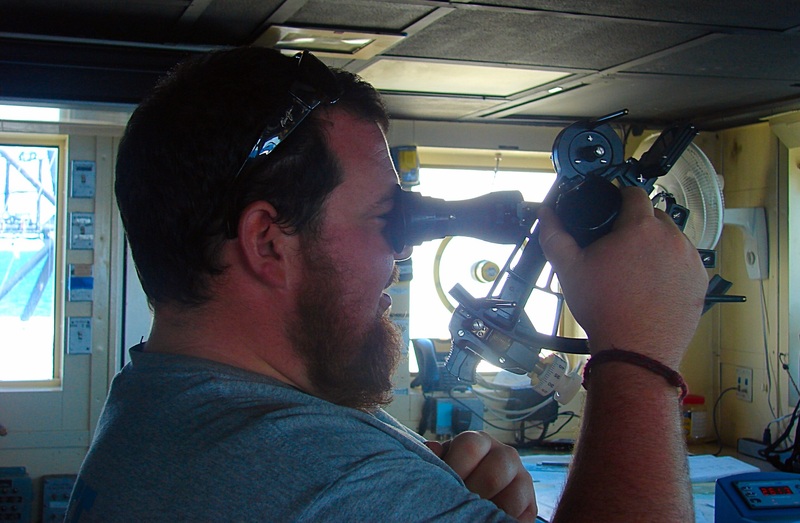 Seaman Ryan Loftus teaching me how to use a sextant. They also have a well-used copy of the “bible of navigation,” The American Practical Navigator written in 1802 by Nathaniel Bowditch. 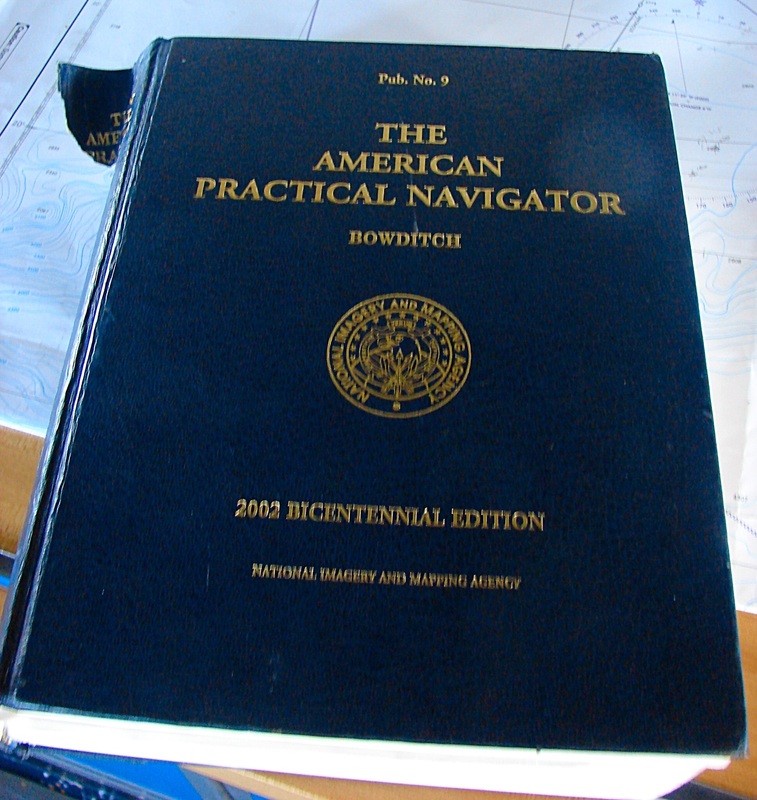 The American Practical Navigator, The “Bible” of navigation for over 200 years. They even let me take it for a spin – okay it was about a 90˚ turn – but hey, it feels pretty cool to be at the helm of a 224ft vessel! Steady as she goes! Mrs. Paulsen’s at the helm! As I said we have begun mapping in our second priority zone, more than 100 miles north of Puerto Rico. We are near the boundary of the Sargasso Sea. It is not bordered by land, like other seas. Instead it is bordered by ocean currents that keep the surface water in one area. Remember the seaweed I wondered about in an earlier post? It is called Sargassum. It grows in rafts in the Sargasso Sea. This is actually where the Sargasso sea got its name. According to NOAA’s National Ocean Service, these rafts provide habitat for certain fish and marine life. Turtles use them as nurseries for their hatchlings. In recent years large blooms of Sargassum have been washing up on nearby coastlines causing problem along the shore. (Oct 1, 2014, USA Today) More research needed! There are always more questions. Is this caused by warming oceans, by oil spills, or by a combination? Nothing lives in isolation. All life forms are connected to each other and to our environment. Changes in the ocean impact us all, everywhere on the globe. A Sargassum Mat. Photo courtesy of NOAA. Want to explore yourself? Check out NOAA Corps to become ship officer! Acting Executive Officer (XO) Lieutenant Fionna Matheson is augmenting on this leg of the trip, meaning she is filling in for the XO currently on leave. 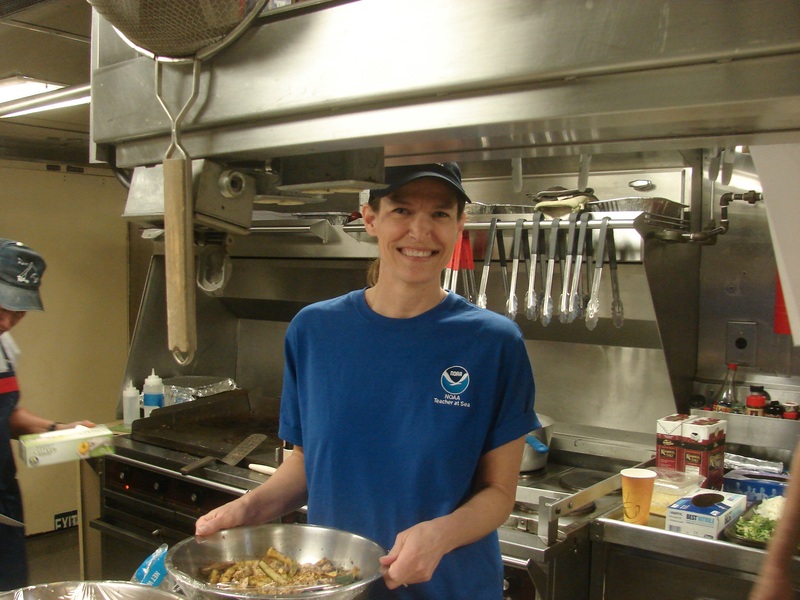 Otherwise, in her current “land job” she works at NOAA headquarters for the NOAA Administrator, Dr. Kathryn Sullivan. Dr. Sullivan, a former astronaut and the first American woman to walk in space, reports to the Secretary of Commerce, Penny Pritzker. 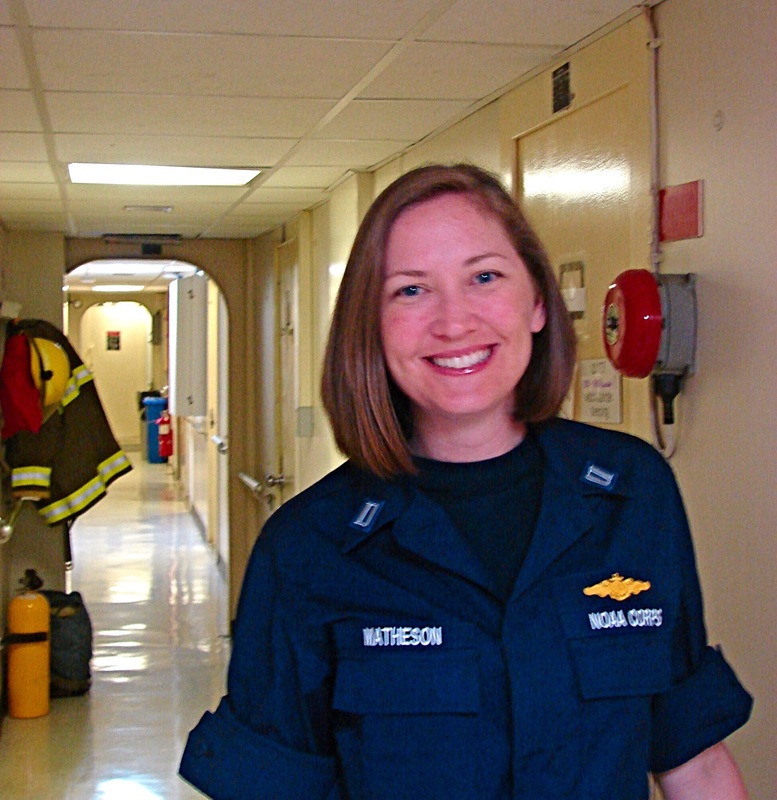 Working on the headquarters team, LT Matheson learns a great deal about the breadth and importance of NOAA’s mission. 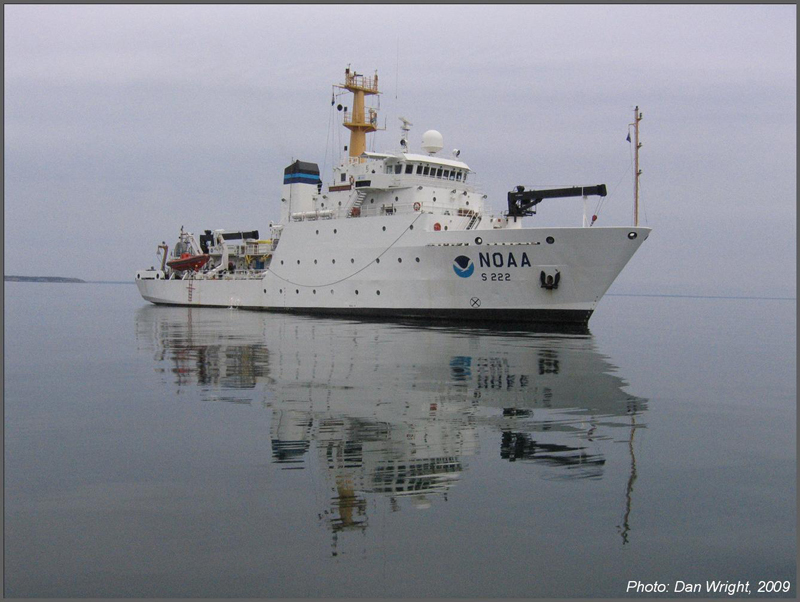 To become a member of the NOAA Corps you must have a Bachelor’s degree in Science or Math. It is a competitive process, so some sort of experience with boating is advantageous, but not required. 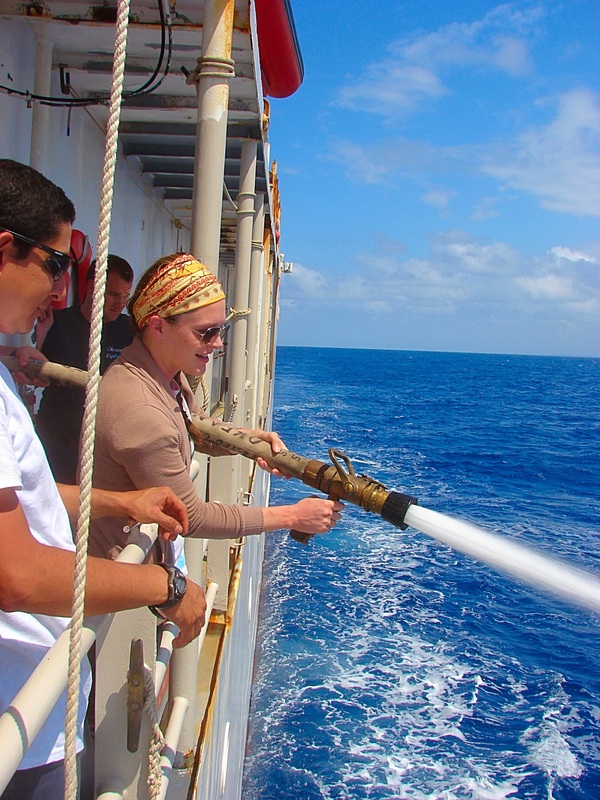 NOAA Corps officers are trained not only to drive and manage ships, but also to handle emergencies including fire-fighting, and follow maritime law. They act as the glue between the scientists and the crew (wage mariners), making sure the scientific mission is accomplished and the safety of the crew and the vessel are secure. Fionna has been part of the corps for 11 years. She explains that NOAA Corps officers are stationed for about 2 years at sea (with some shore leave) followed by 3 years on land throughout their careers. 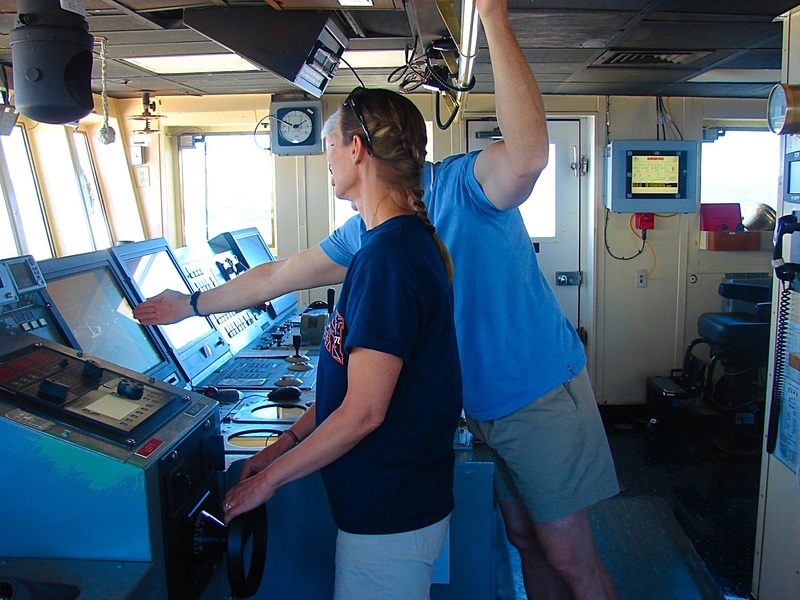 During her NOAA career, Fionna has sailed in the tropical Pacific maintaining deep-ocean buoys, fished in the North Atlantic, collected oceanographic samples in the Gulf of Mexico, and now mapped part of the Caribbean. 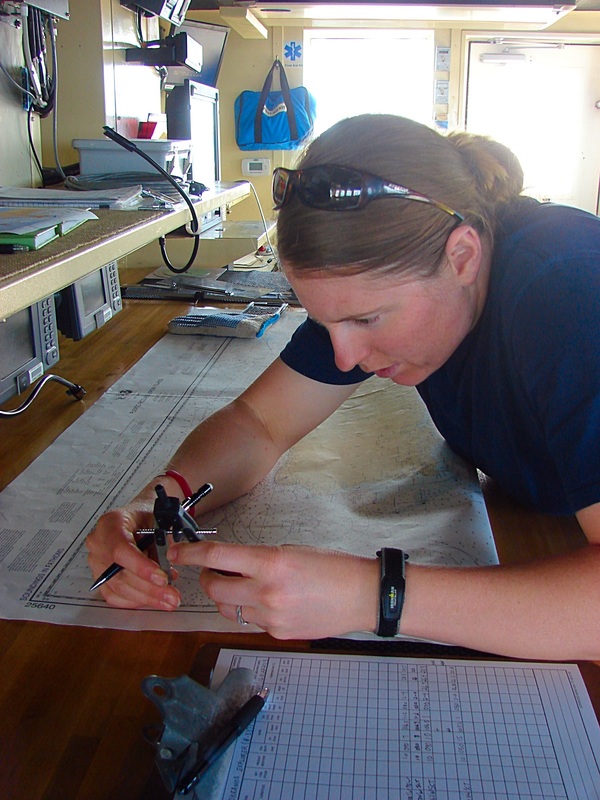 She has also worked as part of an aerial survey team in San Diego, studying whales and dolphins. What do we do for fun in our free time? 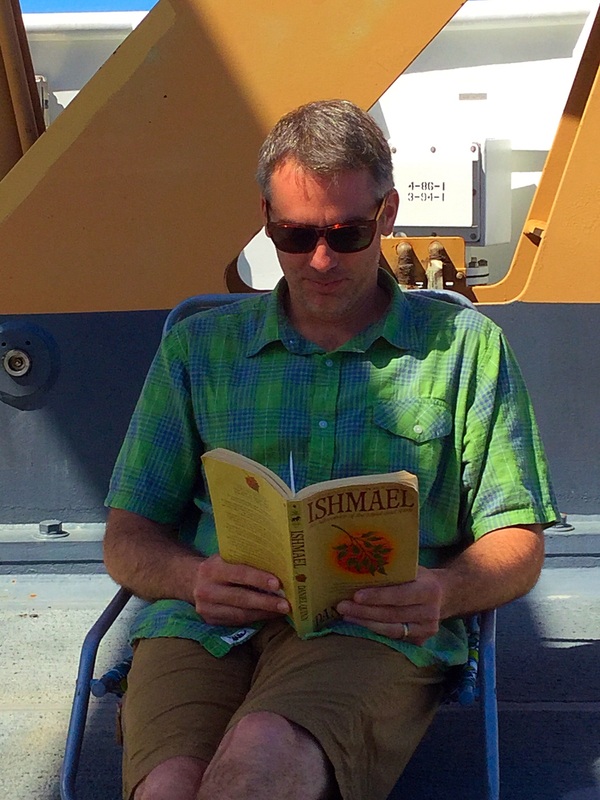 Jason Meyer, Mapping Watch Lead, reading on the Okeanos during his off hours. We play games like chess, although I am not very good. I try, and that is what is important, right? 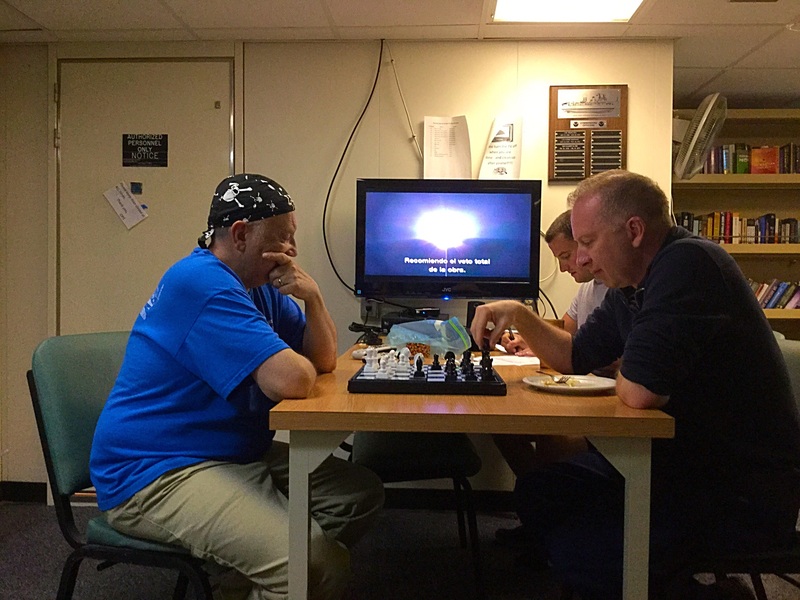 Chief Steward Dave Fare and CO Mark Wetzler playing a warm up game before the chess tournament. 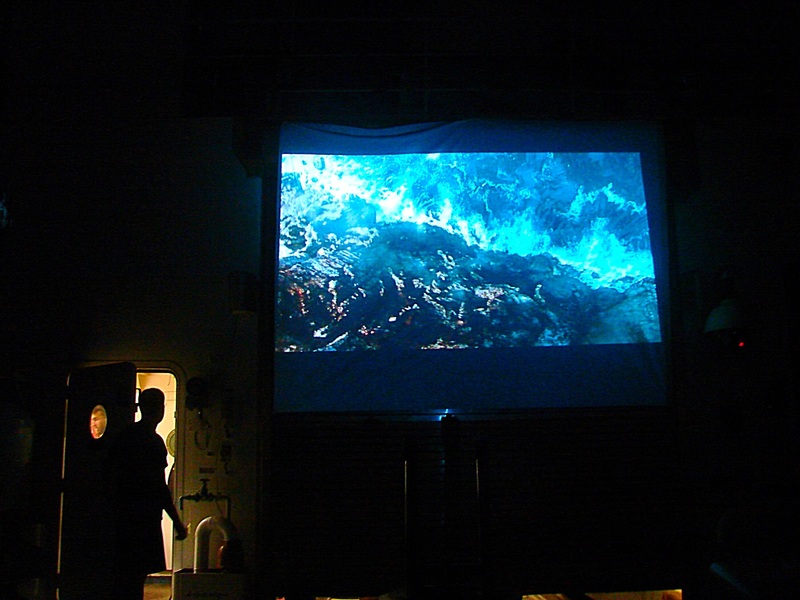 We watch movies – even watched Star Trek on the fantail one evening. Very fitting since we are boldly going where no one has gone before with our high-resolution sonar. Movie night on the fantail. And we watch the sun go down on the ocean. A view from the fantail of the ship. Mostly, I like watching the water when I have time. I would have made a great lookout – I should look into it after I retire from teaching. I have been trying to use my Aquaman powers to summon the whales and dolphins, but so far – no luck. Maybe on the way back in to shore we’ll catch another glimpse. My family and friends. Hi Bryan, Ben, Laura, Dad, Mom, and the rest of the gang. And my students and coworkers. Go Ashland Oredockers! I am fortunate to have such supportive people behind me! Thanks, guys! I do not miss snow and cold weather, so if you all could warm it up outside in northern Wisconsin over the next week, I’d appreciate it. I’ll see what kind of strings I can pull with these NOAA folks! ¡No me gusta la nieve o el frío en la primavera! Sky conditions on the bridge are determined by oktas. An okta is 1/8th of the sky. If all oktas are free of clouds the sky is clear. If 1-2 oktas contain clouds, the bridge reports few clouds, 3-4 filled oktas equal scattered clouds, 5-7 equal broken clouds, and 8 filled oktas means the sky is overcast. Elizabeth “Meme” Lobecker, Physical Scientist Hydrographer with the NOAA Office of Ocean Exploration and Research and our Expedition Coordinator, gave the science team aboard the vessel an overview of our expedition on Sunday after an evening of becoming acquainted with the ship and other members of the science team. She explained how oceanic exploration research is different from the rest of the scientific community and even other projects within NOAA, because it focuses purely on exploration and discovery that can generate hypotheses. In other areas, a scientist has a hypothesis first and sets out to test it through research and experimentation. The information gained on our mission could generate hypotheses in all kinds of areas of research such as geology, fisheries, oceanography, marine archeology, and hydrography. It could help us identify areas that need protection, such as spawning grounds for commercial fish populations. Meme and her team will turn the data over to the National Coastal Data Development Center within three weeks. 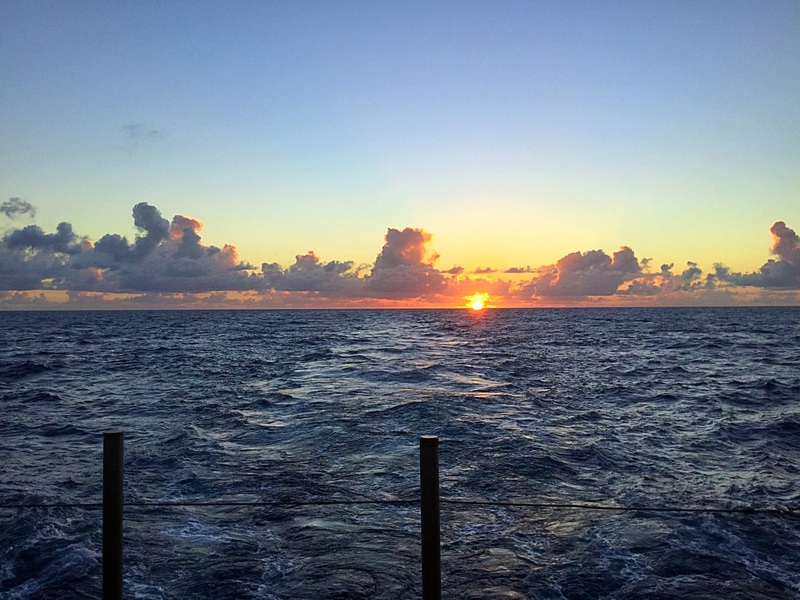 From there, it goes to the National Geophysical Data Center and the National Oceanographic Data Center, where it is freely accessible through public archives within 60-90 days of the end of the cruise. From there, any entity, public or private, can access the data for use in their work. Have you ever wondered how Google Earth and Arc View GIS get the background data for their ocean floor layer? This data contributes to those layers. Now you know! Public data access is through www.ngdc.noaa.gov and www.nodc.noaa.gov. 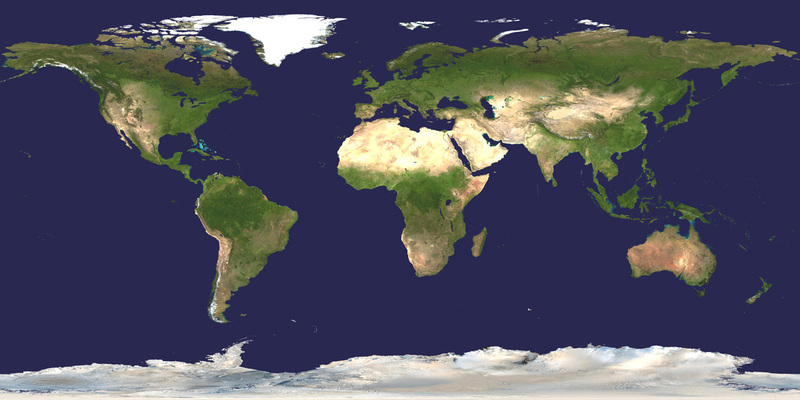 While we currently have low resolution data from satellites, less than 5% of the oceans have high-resolution images. We have better data now about the features of Mars than we do about our oceans on earth. Why? 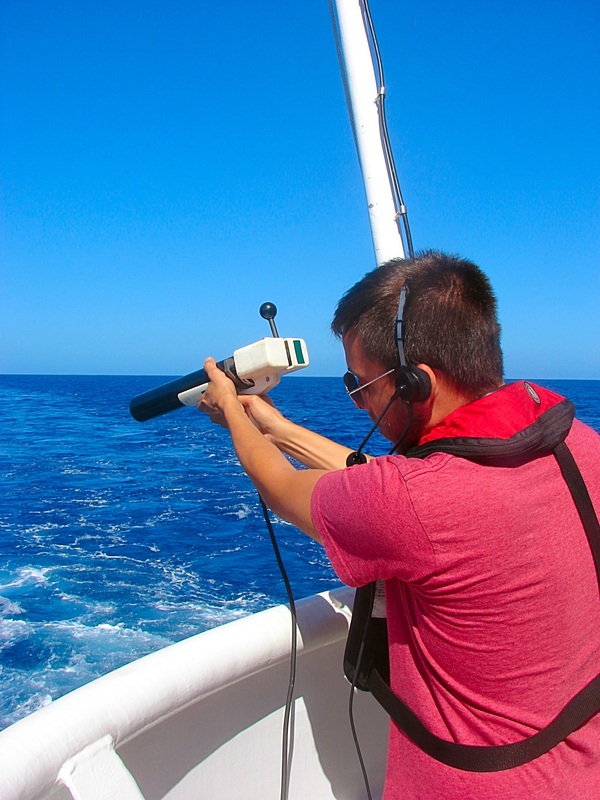 Because ocean surveying is difficult and time-consuming. High resolution maps cannot be made of the ocean floor with current technology on satellites. The technology is getting better and better, though. 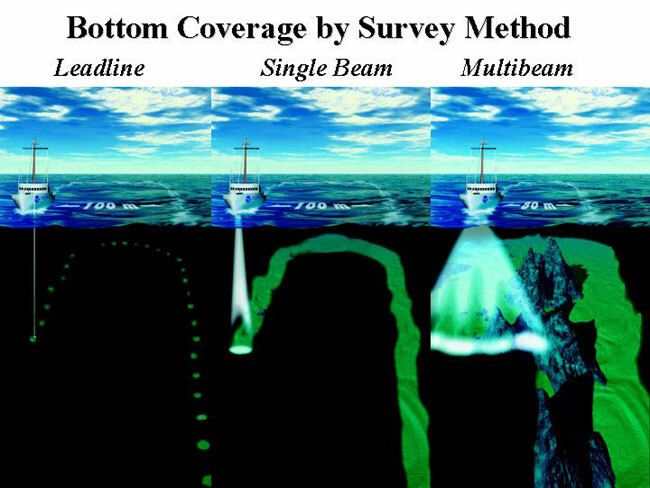 The image below shows the progression from a leadsman dropping a 10 pound weight attached to a line in the water to the multibeam sonar being used as I type. 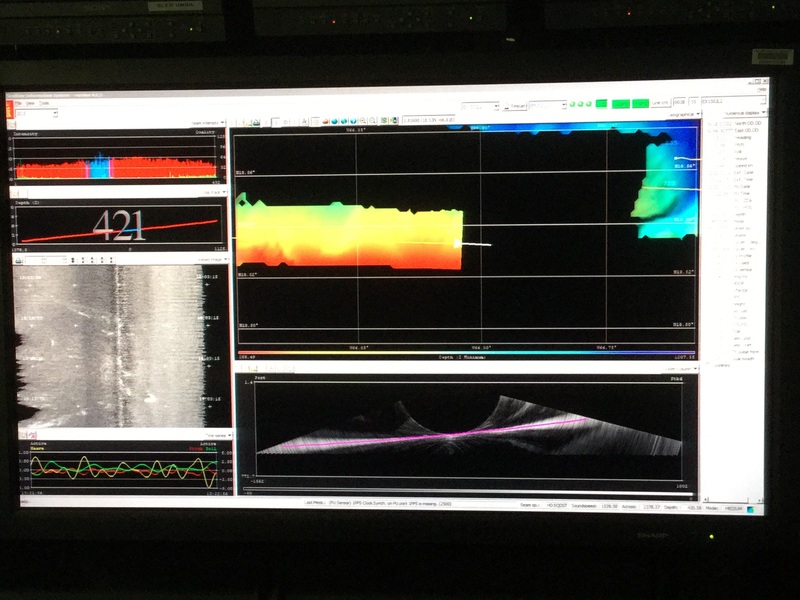 The multibeam sonar aboard the Okeanos Explorer sends out a ping at 30 kHz that bounces off the seafloor and returns to the transducer that is equipped with sensors oriented in 432 different directions receiving up to 864 beams per swath. This method has been tested in depths of up to 8000 meters. It can give us not only bathymetry data, but also water column backscatter and bottom backscatter data. This allows us to know if there are features in the water column like gaseous seeps escaping from the ocean floor. We can also tell something about the surface features, whether they are soft sediments or hard rock, from the bottom back scatter. Meme has a crew of mappers working with her including Scott Allen, Senior Survey Technician; Melody Ovard and Jason Meyer, Mapping Watch Leads; and several interns. Another important part of the mission is to train a new generation of ocean explorers. These interns, Chelsea Wegner, Kristin Mello, and Josue Millan, come from colleges all over the country. Their main job is to make sure the data is good and to create logs to document data collection. They have to correct the multibeam sonar data by deploying XBTs (Expendable Bathythermographs) that determine the temperature changes within the water column because sound speed increases as water temperature increases. 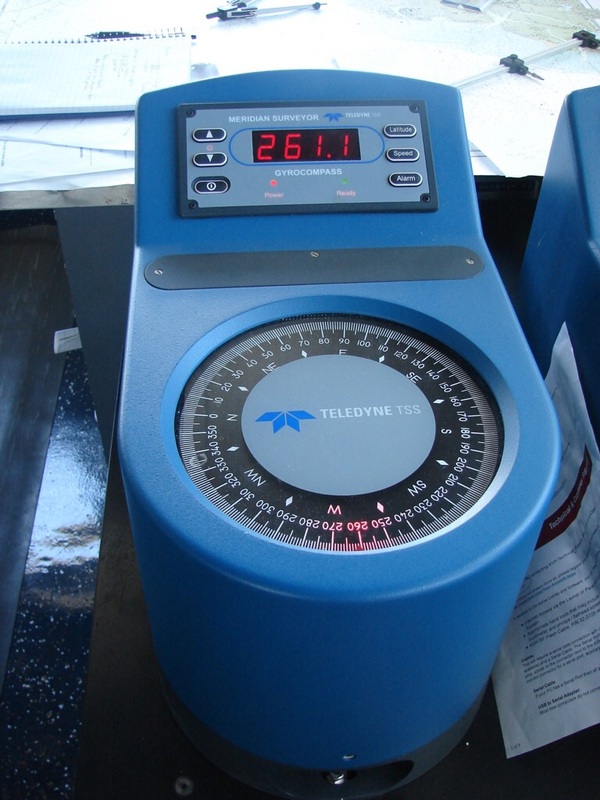 They also use sensors on the ship to measure the conductivity and therefore determine the salinity of the water. Since sound waves penetrate saltier water more easily, the salinity affects the sound intensity measurements. Pressure must also be calculated into the equation because sound speed also increases with increasing pressure. The vessel’s attitude also has to be factored into the sonar (like teachers need to factor in student attitudes when planning a lesson!) Similar to an airplane, a boat can pivot on its center of gravity in all three-dimensional axes: Pitch, Yaw, and Roll. Think about your own head. Pitch is like nodding your head in agreement, yaw is like shaking your head to say no, and roll would be like putting your ear to your shoulder. Gives new meaning to the phrase “Heads are going to roll,” doesn’t it? Boats also heave, or move up and down as swells pass beneath them. This screen shows the data being collected by the mappers. The screen shot above shows the data as it is being collected by the mappers. 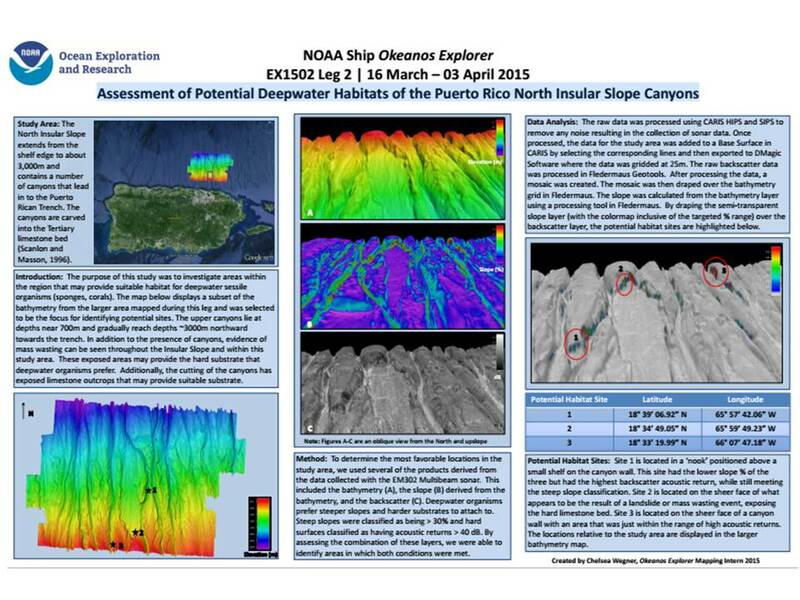 In the main window in the upper right is the bathymetry data. Below that is the water column backscatter. In the bottom left is the attitude of the vessel on all axes. 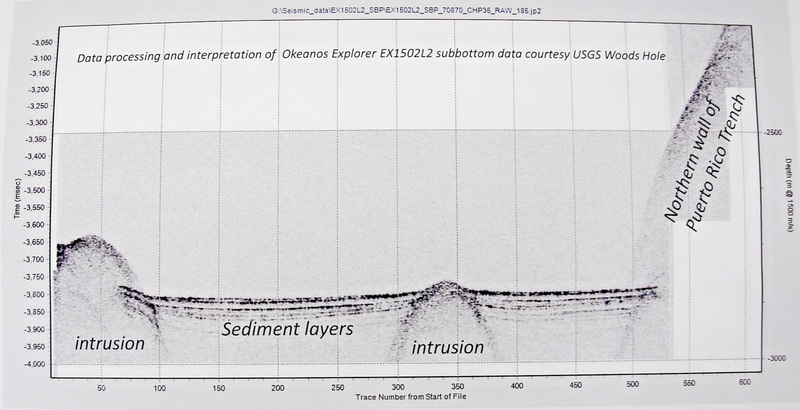 The center left gray image shows the bottom backscatter while the number 421 above is the current depth beneath the vessel. Finally, the display on the top left indicates the quality and intensity of each of the 432 beams. We also have a team of researchers from the University of Puerto Rico that are deploying free vehicles to study water masses within the Puerto Rico Trench. More about them in the next blog! Safety First! On Monday, we had our first drills as part of our safety training. We practiced the “Abandon Ship” and “Fire” drills. We tested the fire hoses and donned our gumby suits. Mrs. Paulsen is looking pretty good, eh? It is comforting to know I’ll be well-protected by good equipment and a great crew in the event of an emergency. 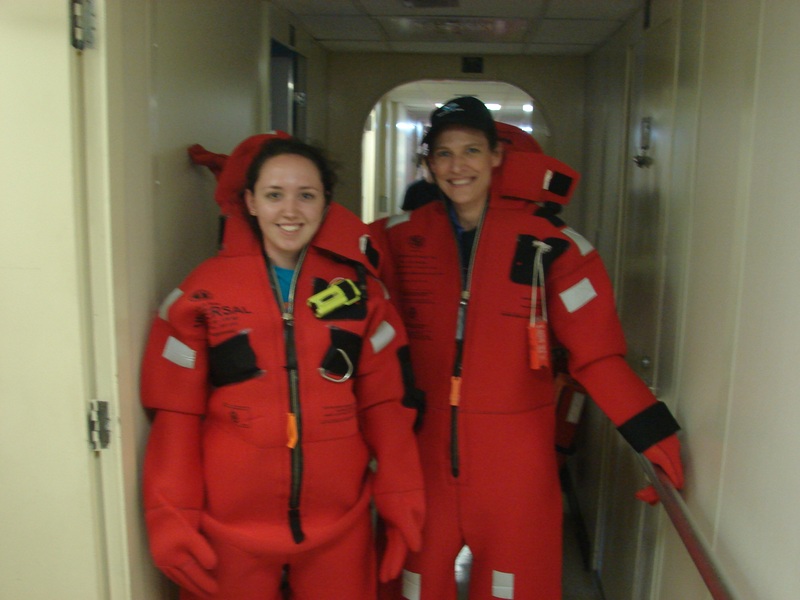 Kristin Mello and I are trying out our gumby suits during the first “Abandon Ship” drill. Chelsea Wegner testing a fire hose. After mapping all morning, we learned we had to return to port due to a medical issue. I discovered that engineers are vital to the operation. 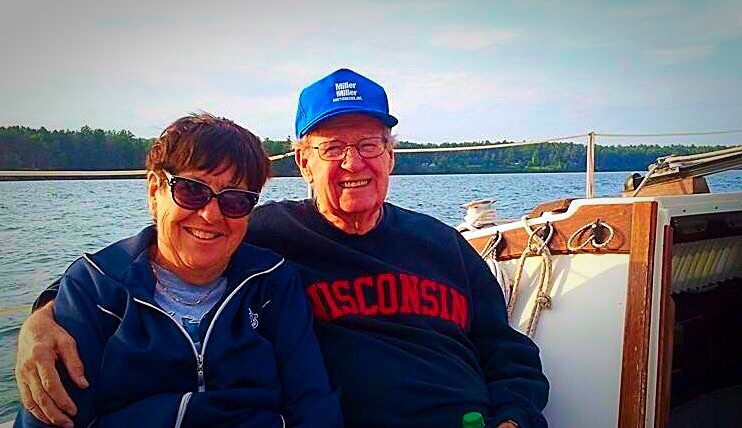 Without them, we don’t sail – and they are hard to come by. All of my students interested in marine engine repair should consider NOAA in the future. The pay is good and the adventure is awesome! I took the time in port to work in the galley helping to make lunch with the chefs. They are a friendly bunch. We made fajitas of all kinds and swordfish. Delicious! I also learned how to garnish a buffet line and even washed dishes afterward. In my high school and college days I worked in many restaurants, but they never let me work in the back. They said I was too much of a “people person” and so I was always waiting on customers. Today I got to cook on one of those large grills I see on cooking shows. Fun to cook on, but not fun to clean. The Chief Steward, Dave Fare, said he brought 5000 lbs of food on board for our trip! We’ll be eating well! Good thing there is a fitness room on board too! Ranier Capati, Chief Cook showed me how to garnish a line. After training on Sunday I had some time to take in a little of the history and culture of San Juan, Puerto Rico. It is a lovely place filled with beautifully colored buildings and fun music. The history is fascinating. According the National Park Service, this is where Chrisotopher Columbus landed on his 2nd voyage and laid claim to the land for Spain. Under Juan Ponce de Leon, Spain took control of the island, displacing the Taíno Indians in 1508. An enormous wall of defense was built to keep hold of the island. Trade winds and ocean currents allowed ships to easily sail here from the east. The fortifications on the island took 10 generations to build. Spain kept control of the island against invaders until the Spanish-American war in 1898 when Puerto Rico became a US Territory. The fortress including the Castillo de Felipe del Morro and the Castillo San Cristobal are now historical sites managed by the National Park Service. You can learn more here. After touring the city, I found my way to the sea! I watched children running from the waves. This reminded me of my childhood. My father used to take us to the coast when we lived in California and Oregon. That is where my love of the sea began. Both of my parents have adventurous spirits and strong work ethics. They taught me that anything is possible if you are willing to take the chance and put in the effort. This is a belief I hope I pass on to my students. Can you identify this crustacean I found along a beach in San Juan? 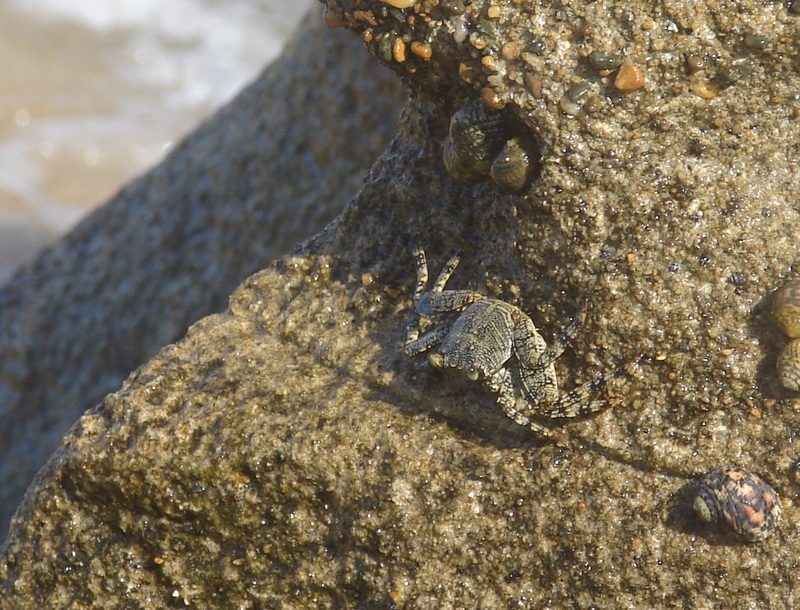 Crab on the beach of San Juan. Can you classify it? 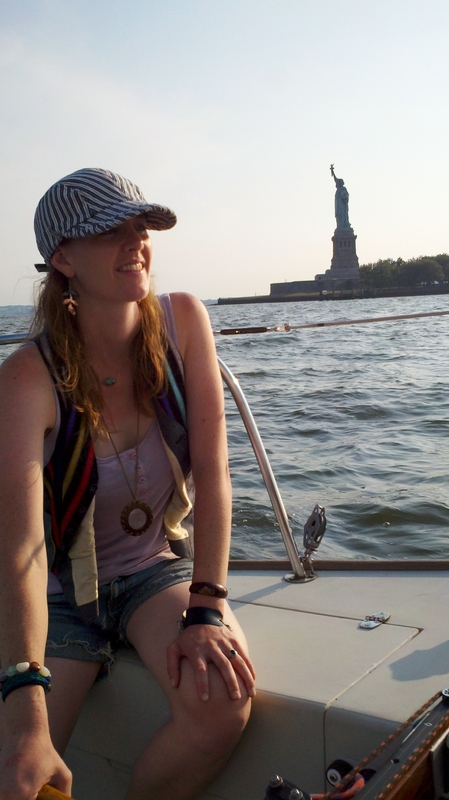 Sailing on the Hudson River Estuary next to Liberty Island. 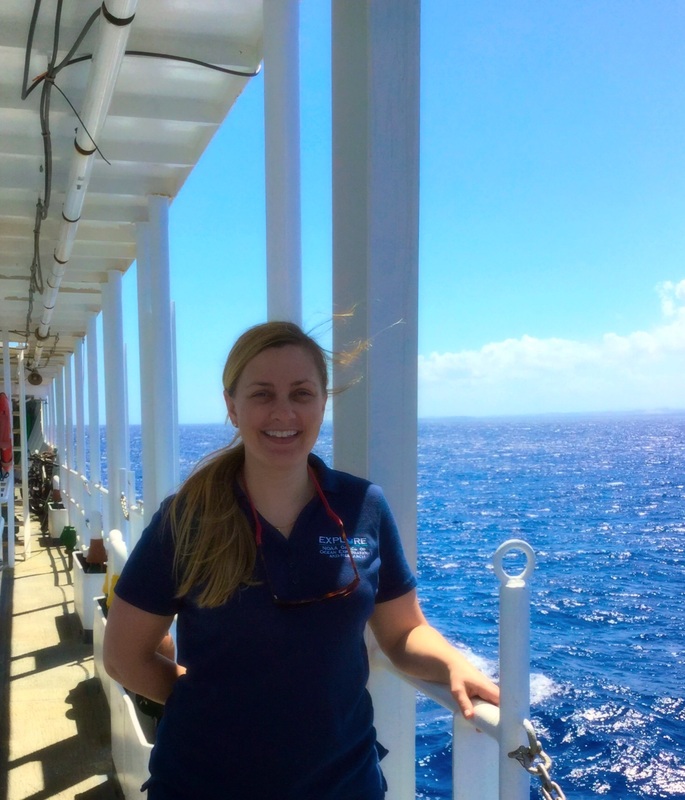 Greetings, my name is Paige Teamey and I will be sailing on NOAA Ship Thomas Jefferson as part of NOAA’s Teacher at Sea Program. I am a graduate of Wheaton College with a double major inPhysics and Environmental Science. I am a native Oregonian, but have called Brooklyn, NY home for the last eight years. I love the outdoors and have had many opportunities to explore upstate New York and observe a side of the east coast that is raw and beautiful. I have a great love for being outside and spending as much time as I can with my family. I have lived and taught high school earth science, anatomy and physiology, forensics, experimental design, and material science for the past seven years at Brooklyn Academy High School. I deeply enjoyed the students I taught as well as the faculty and community that existed at the school and in the neighborhood of Bed-Stuy. I departed from Brooklyn Academy this year to follow a passion and help provide students at a younger age access to science and engineering with Iridescent. Iridescent is a non-profit science and engineering educational organization located in Hunts Point, NY where our vision is to use science, technology and engineering to develop persistent curiosity and to show that knowledge is empowering. 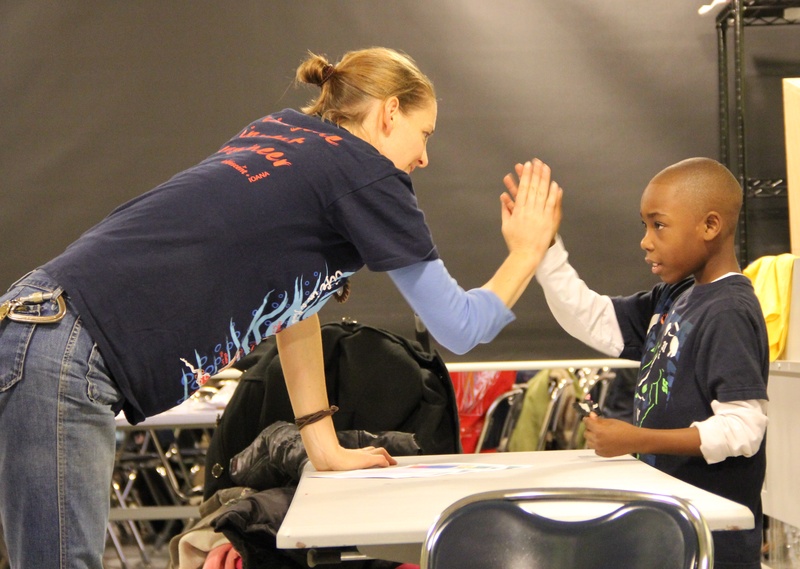 Iridescent is a community-based educational outreach organization that supports student growth through lifelong mentorships and community sharing, development, and learning. 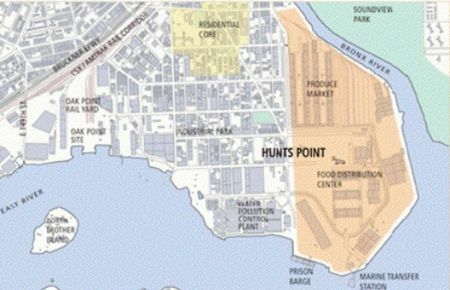 Hunts Point is located on a peninsula and is home to the largest food distribution site in the world as well as the largest fish market in the world outside of Japan. Hunts Point receives enough food annually by ship to feed 30 million people in and around New York City. Hunts Point is a tidal strait located between the Bronx River and the East River. Each ship that travels from their homeland bringing products to NYC relies on nautical charts in order to steer around shallow areas, especially at low tides (check out the current moon phase today). On my voyage with NOAA, I will learn how to conduct seafloor mapping (hydrographic surveying) of Block Island in order to update and generate nautical maps. 70% of our world contains OCEANS. Life exist in a very small slice on land when compared to the enormous depths of our oceans. Life on land occurs in a very thin layer from just below the ground to the tops of our tallest trees (about 1 mile or 20 blocks) . In the ocean life occurs in every layer where some areas are more than seven miles deep (140 blocks). NOAA (National Oceanic and Atmospheric Administration) is an amazing organization that has hundreds of scientists and engineers exploring and learning about our oceans everyday. NOAA shines new light on our oceans unexplored worlds everyday. For the students and families following my journey Shine your light!! Be curious with a passion. Keep your eyes open to the skies, below your feet, into the wind, with every step to school/work or while sitting in silence… question everything. I look forward to bringing you answers and videos to any questions or any interests you have about my journey. Click on the words when they are highlighted purple/blue in order to learn more. You can follow my journey and adventures in this blog and daily ship position via the NOAA Ship Tracker. Just click on the hyperlink, enter the ship tracker and select the Thomas Jefferson from the drop down menu on the right side of the screen.